Join the Disciples of Dirt for a weekend of riding, camping, eating, drinking and FUN over on the east side in sunny Sisters, Oregon! Whether you are a newbie to mountain biking, a weekend warrior, or a pro racer … everyone is welcome! We’ll be in our usual spot on the beautiful Whychus Creek just 3 miles south of Sisters. People will start arriving Thursday night or Friday and do their own thing. Saturday we hope to do the traditional group shuttle ride on Trail 99 from Three Creeks down through Peterson Ridge. According to reports, it’s logged out and good to go! 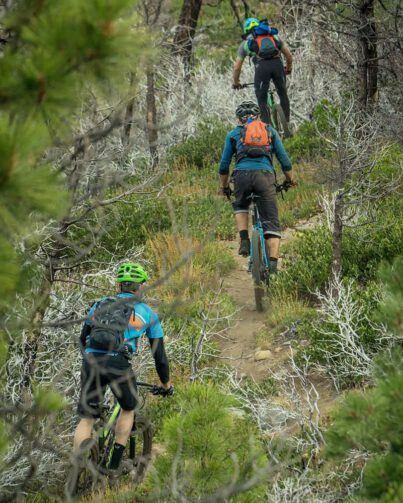 There are lots of other ride choices too, including the Peterson Ridge network, Smith Rocks, or any of the many trails in Bend. Saturday night back at camp we’ll have a potluck dinner which always brings out the dutch oven chefs and is always over the top amazing. Afterwards we’ll hang out and socialize around the usual giant bonfire enjoying refreshments provided by Oakshire Brewing, DOD’s awesome beer sponsor. NOTE: This is a large disbursed campsite with no picnic tables or drinking water, although DOD will arrange for a port-a-potty (or two). Please bring something amazing for the potluck as well as your own plate, utensils, and drinking vessel so that we can keep this event as green as possible. Check the forum or our Facebook Event closer to the date for more details and chatter.